Plenty of options to expand capacity and the option to move to high capacity toners for busy offices help to raise the Canon i-Sensys LBP352x above a lot of the completion. 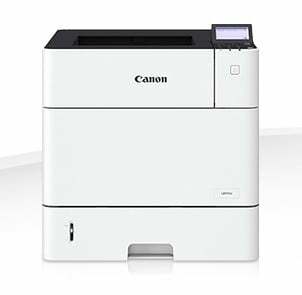 Canon’s i-Sensys LBP-352x mono printer is a modular printer which it to grow as you do. A simple display sits on top with most management being done from your computer. A relatively small footprint allows the Canon LBP352x to be placed easily around an office. 62 pages per minute print speed means the Canon iSensys LBP-352x will run through your toner at quite a rate. Luckily the LBP-352x toner cartridges are available in a high capacity variant. Extra paper trays can take the capacity up to 3600 pages and with double-sided printing available as standard, you won’t have to fill up the paper tray every few minutes. Secure printing and storage are only option extras, which may be worrying as security becomes a popular concern especially as this printer can be connected to wirelessly.